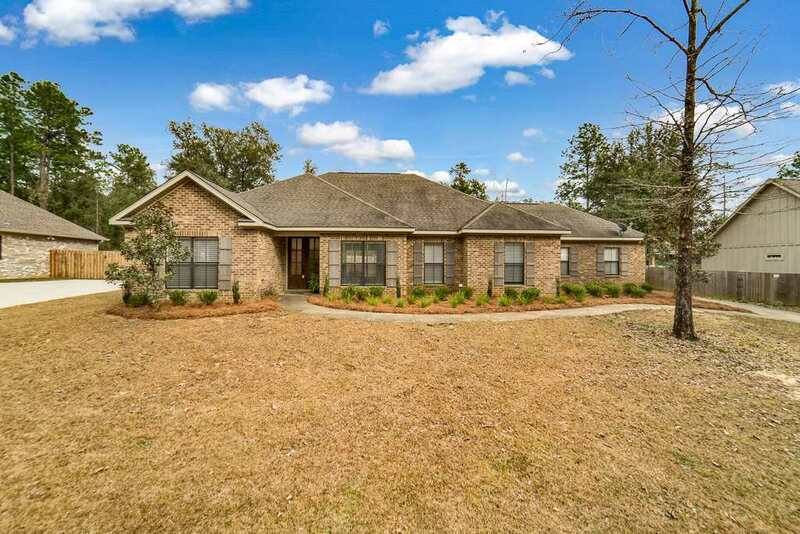 Beautiful, custom all brick home in Quail Creek Estates golf course community. No POA dues and close to everything! This home has 3 bedrooms/ 2 baths and all on one level. Gorgeous wooden entry door. Light colored, hand-scraped hardwoods in living and dining rooms. Tile in kitchen and baths. Custom cabinetry in kitchen with granite counters and bar top, stainless appliances, and gas range. Fresh paint throughout most of home. Rannai tankless hot water heater. Master bed/bath combo with double marble vanity, his and hers walk in closets, jetted tub and separate shower. Storm shutters. Large private beautifully landscaped back yard. This home has it all. Don't miss seeing it. Directions: From Hwy 98, Head East On Fairhope Ave/48. Take A Right On 181. Turn Left At The Flashing Light Into Quail Creek Estates/Quail Creek Dr. Turn Left Onto Quail Creek Dr Then Left On To Bunker Loop. House Will Be The 2nd House On The Right.